In the previous lesson our task web-app-tests consumed an input resource and ran a script that ran some unit tests. The task did not create anything new. Some tasks will want to create something that is then passed to another task for further processing (this lesson); and some tasks will create something that is pushed back out to the external world (next lesson). So far our pipelines' tasks' inputs have only come from resources using get: resource-tutorial build plan steps. A task's inputs can also come from the outputs of previous tasks. All a task needs to do is declare that it publishes outputs, and subsequent steps can consume those as inputs by the same name. If a task included the above outputs section then its run: command would be responsible for putting interesting files in the some-files directory. Subsequent tasks (discussed in this section) or resources (discussed in the next section) could reference these interesting files within the some-files/ directory. 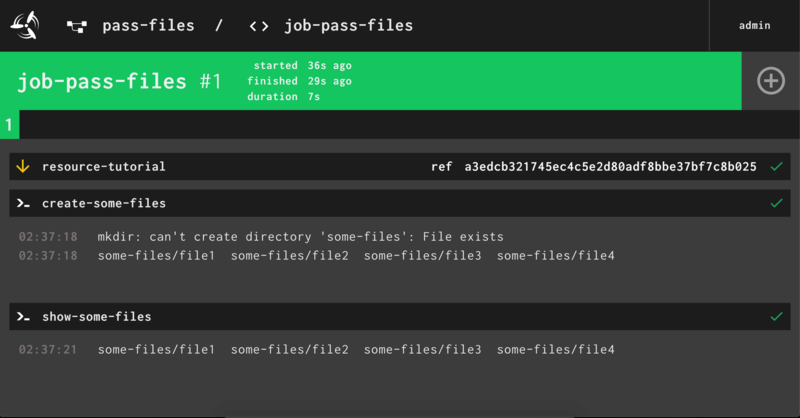 The former creates 4 files into its own some-files/ directory. The latter gets a copy of these files placed in its own task container filesystem at the path some-files/. The pipeline build plan only shows that two tasks are to be run in a specific order. It does not indicate that some-files/ is an output of one task and used as an input into the next task. This is a demonstration that if a task includes outputs then those output directories are pre-created and do not need creating.